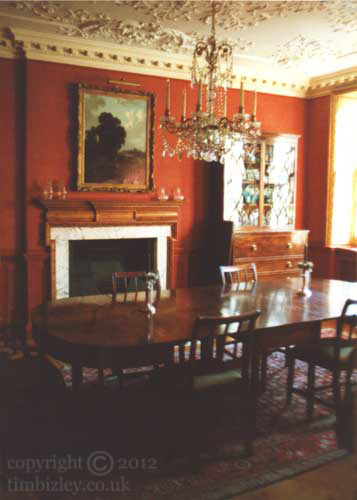 During the re-decoration of this interior wood graining was applied to the fire place, and the window panels and shutters in Georgian Pine. A dragging paint effect was applied to panels beneath the chair rail. This served to emphasize the architecture of the panel structure whilst coordinating with the fabric treatment to the walls. Because of their historic use as well as their subtle and mellow appeal many paint finishes are ideally suited to be used in the decoration of historic interiors. By using these methods the specialist decorator can elevate the period interior to achieve a level of authenticity which would not otherwise be possible. The use of recherche furniture and furnishings completes the integrity of the overall feel of the space.